The Pultronic EQ-110P promises to add some vintage character to your sound. 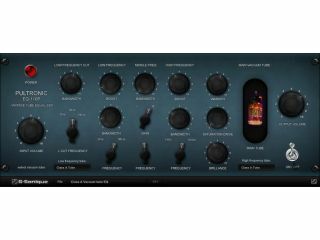 The Pultronic EQ-110P is a new vintage-style EQ plug-in from G-Sonique Digital Instruments that may or not be based on the classic Pultec EQP1A (OK, it is). Designed to add "real and hearable warmth, colour and dynamics" to your music, this features four parametric filters: low frequency cut, low frequency boost, middle frequency cut / boost and high frequency boost. You'll also find Warmth, Saturation Drive and Brilliance controls, while there are input and output vacuum tube volume stages. Said to be suitable for recording, tracking and mixing, the Pultronic EQ-110P is a Windows VST plug-in. Its full price is €38, though the first 40 people who buy it will only have to pay €19.90.